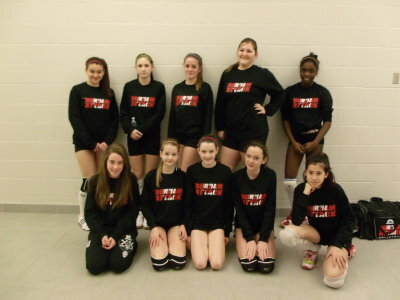 On Saturday Dec 17, 2011 DA 14U White played their second OVA tournament of the season in Newmarket, hosted by Aurora Storm. The first match of the day saw the girls face off against the Selects. Attack’s strong offense and solid defence enabled them to take an early lead. The girls played well together to win 24-11 and 25-13. In their second match of the day, the girls faced the tournament hosts, Aurora Storm. The girls played hard, but they lost 25-7 and 25-16. The third match of the day faced the Titans, which ended in losing 25-13 and 25-13. By the fourth match, the girls had re-grouped and came out strong. They faced the Selects, taking an early lead and never looking back. They finished the day with 25-9 and 25-20 wins. In Cobourg on February 4, 2012 the day started with facing against Oakville Thunder. Thunder was tough and Attack lost the first set 25-12. The second set saw lots of good hustle and defense, bringing the score very close, but a disappointing loss of 25-21. The next few matchs saw the girls facing tough opposition of Scarborough Titans and DA’s 13U and finally facing Scarborough Titans again at the end of the day. The day brought a lot of positive energy and great team spirit. The girl’s commitment to giving their best and supporting each other will no doubt enable them to go farther in the next tournaments to come. Thanks to the coaches Christine and Cathy for a great day! The latest addition to the Durham Attack’s stellar group of teams is the Girls 14U, Team White!! On Saturday November 19, 2011, DA White, played in their first tournament as a team. The day presented a chance for the girls to bond and really get to know one another. As with any new team, the day started off with jitters and unfamiliar strengths and weakness of fellow team mates; however, as the day progressed, the team continued to build momentum and tremendous improvement followed. It was clear that the girls were communicating better and beginning to gel as a team, which resulted in some victorious games. Overall the day provided for a really good learning and developmental opportunity. Great job girls! Congrats as well to our dedicated coaching staff, Rob, Christine and Cathy, great day! Go Durham White! !